I’ve been wanting to go try out Margherita ever since it opened its doors, in The Courtyard complex under Bin Suleyman building, and for one reason or another only recently did I manage to make it there. We chose the peak time of Thursday afternoon to debut the much heard about restaurant. Parking seemed tight and I hope we would be able to get a table inside. We entered Maragarita and were immediately ushered to a table small table against one of the walls, we were a small party and really couldn’t complain. 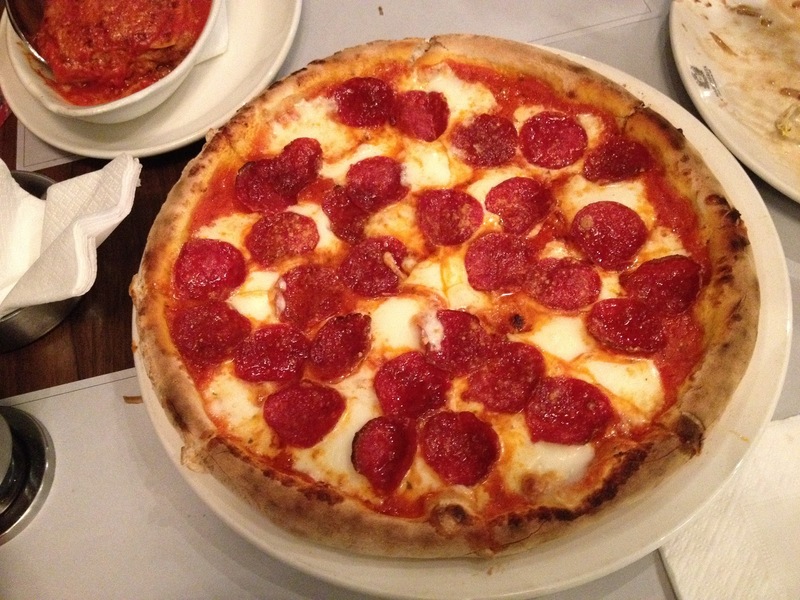 The place was alive and bustling with customers all enhoying a good time, while the smell of freshly baked pizza wafted from the open kitchen where only the pizza was made. We looked through the menu, and decided to order pink lemonades, a insalata di pollo, lasagna alforno, diavolo, and a tiramusu for dessert. The pink lemonades were the first arrive, and although I wasn;t too impressed with the pink or grenadine addition to the original lemonade- next time will stick to the safe lemonade with mint. 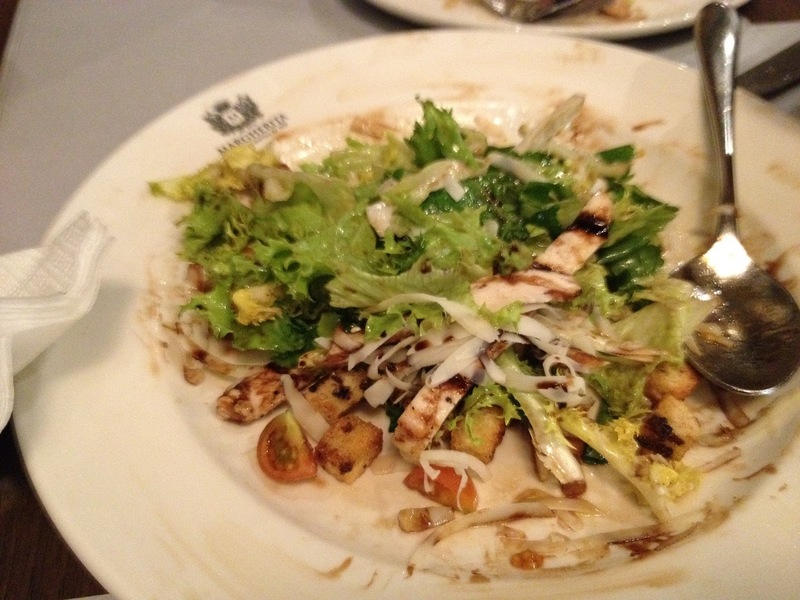 The insalata di pollo arrived next, it was a green salad, with grilled chicken and the chef’s special salad dressing of olive oil and balsamic vinegar topped with shavings of cheese, and various fragrant herbs, cherry tomatoes, and lettuce. It was a generous portion suitable for sharing. The crunchy greens were complemented by the smooth dressing, and this could easily be a meal in itself, if ordered by health conscious dieter. 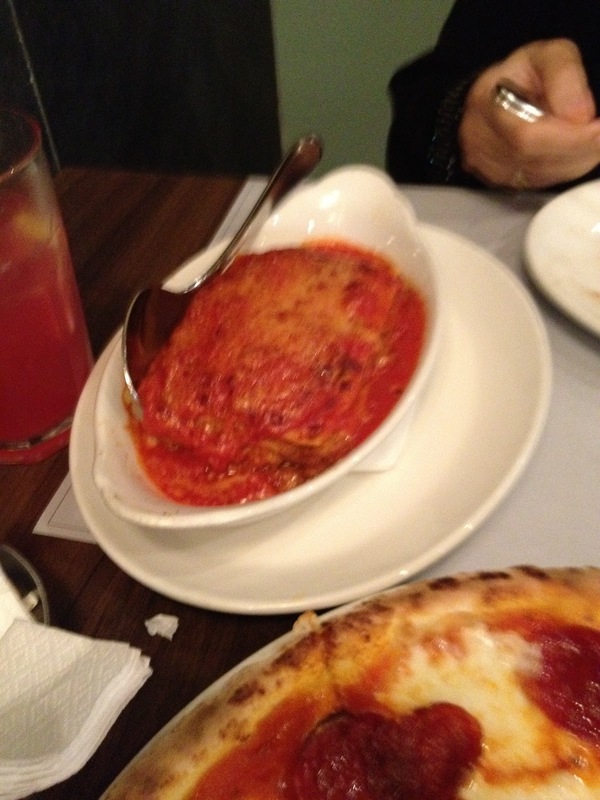 The pizza and lasagne arrived together and the salad was cleared away to make room on our small table. We started off with the beef lasagne, which was how authentic italian lasagne should be and not the greasy American junk they serve in some restaurants. The pasta sheets were well cooked and cut easily. The lasagne melted in your mouth as you savoured the alternating flavours of sauce,cheese, and meat.The size was modest and soon the serving dish was polished clean. The pepporini pizza was very light on a thin traditional brown flour crust, it was wholesome and filling without the overpowering greasiness of too much butter and cheese. The tiramasu, arrived in a small glass, I had to reconfirm it was tiramasu as I was bit surprised by the serving style. I’ve had tried tiramasus in many different restaurants, and Margherita’s was the smoothest and creamiest with the slightest layers of sponge cake sandwiched in the most indulgent layers of cream cheese. There was hint of coffee and chocolate but it didnt overpower the overall flavour the dessert. We decided to try the date and almond ice cream- which was simply divine. It powdered biscuity substance reminded me of Dutch biscuits that I used to adore as a child, and the ice cream had full bodied sweetness to it and the powder added a nutty smoky flavour. Over all the service was attentive, the food fresh, flavourful, the dessert sublime. Margherita ticks all the boxes and will definitely become one of my favourite haunts. P.S as per the new law there was no service charge and our bill came to a reasonable SR265- great value for money.